Rwanda could be preparing to join the club of weapons manufacturing countries in the region and Africa and it seems the government has been preparing for this for so long. 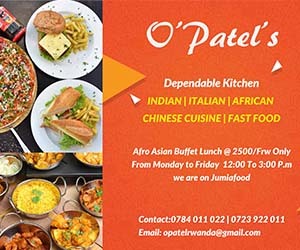 With the excellent track record in Peacekeeping operations across the globe, Rwanda may be considering domestic production of weapons as an important segment in strengthening its Military capabilities but also tapping into this lucrative domain. The country’s Parliament has already deliberated on the new law which outlines detailed clauses specifying, acquisition, licensing, manufacture, and trading of war machinery. The sudden debate on this law has generated widespread concerns among Rwandans especially on the provision of owning a gun. Justice Minister Johnston Busingye said the concerns are because many Rwandans rarely hear about arms talk in the country. However, he said that despite this silence on arms, a law has to be in place. But is the new law just for the sake of fine tuning and extending modalities of owning a gun in an already secure country that attracts more than a million visitors and hosting dozens of important continental and global conferences? Four years ago, President Paul Kagame flew to Ethiopia for an important rendezvous but back home the media only reported the story in passing. But President Kagame had a futuristic plan that aims at catapulting Rwanda into a new horizons. On April 17th 2015, Kagame arrived in the capital Addis Ababa and was driven to Ethiopia’s Metals and Engineering Corporation- Bishoftu Automative Industry. The president was accompanied to the facility by Foreign Affairs Minister Louise Mushikiwabo and defence Minister Gen. James Kabarebe and other officials. After getting treated to a guard of honour, the President and his delegation were given a guided tour around the facility. 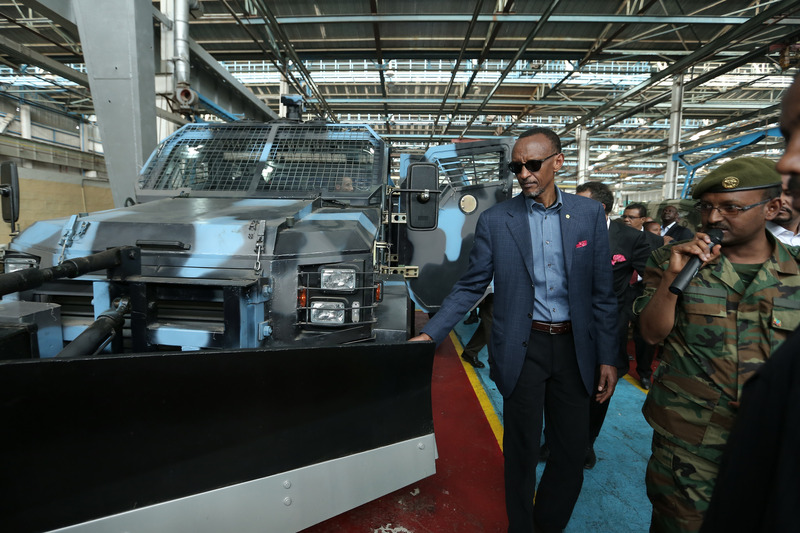 The guide explained every phase and level of equipment, tools and machines on the assembly lines – President Kagame was so keen and observant for every detail on the assembly line. Light Trucks, buses, Armoured Personnel Carriers (APCs), tanks and several war machines get chunned out of this facility which employs hundreds of welders, mechanics,painters and several experts of the auto and military domain. The facility does not look any different from what we see in Europe or Asia and other developed auto industries. An Ethiopian Journalist who had direct access to President Kagame after the guided tour posed a question on what lessons there were for Rwanda through the tour of the facility – and this is what Kagame said. There is a lot to learn from Ethiopia and there is a lot to share from the different experiences we have had in different contexts. But certainly when you see the industriousness of Ethiopians and the Vision within which they are carrying out their development, it is something we want to learn from. we have had many of our young people study and work with their counterparts and have been part of what has been built in Ethiopia. This is a very interesting step in learning and sharing experiences for us. However, Kagame told the Journalist that he was looking for deeper collaboration between the two countries in this domain of Industrial socio-economic development and how this can enhance and strengthen our desire for security and stability of the two countries. How do you divorce the military and security capabilities which in any case comprise of young men and women from the overall social economic transformation. And the fact that in Ethiopia they have been able to blend the two, that is something of importance and to emulate. But the Journalist asked a golden question and it seemed obvious. Mr President Do you have plans to set up this kind of project in your country? We are doing that to be able to do similar things in our own situation other than continuing to have collaboration. Ethiopia produces small arms, rifles and grenades propelled by rockets. Who Else Is Producing Arms In Africa? Kenya, Uganda, Tanzania are all engaged in weapons and military hardware production. Rwanda is definitely expected to join the ranks very soon under the new legal framework that is key in setting ground for entering this sector. The East African states for example Tanzania began producing arms as early as the 4th century AD. Uganda started as early as 1870. South Africa – It’s arms industry has one of the most advanced in the non-Western world today, on par with fellow IBSA partners, India and Brazil. The country which endured a gruesome apartheid has wide-ranging locally-made weapons—some of which were categorized as crowd-control equipment—included transport and attack helicopters, armoured personnel carriers, military trucks, internal security vehicles, assault rifles and hand guns. South African weaponry and other military equipment are in high demand in many countries throughout the world, from the United States to China, and from Sweden to Zambia. This country in the horn of Africa has been producing arms since 1800’s under emperor Tewondros, today, the country also has a pretty lucrative industry pertaining to weapon production. Ethiopia produces small arms, rifles and grenades propelled by rockets. This country has been producing its own arms since the 1820s. Their products included “warships, artillery, rifles, bombs and ammunition. Egypt’s arms production began to rise after the second World War. The government established ammunition and small arms companies, as well as aircraft factories. Today, Egypt is one of the top weapon producers on the continent of Africa. Other Arms Producing countries on the continent include; Ghana, Kenya, Nigeria, Sudan, Tanzania, Namibia, Uganda and Zimbabwe.